Firefighters are struggling to control more than a dozen blazes that have scorched thousands of acres. NBC's Gabe Gutierrez reports. 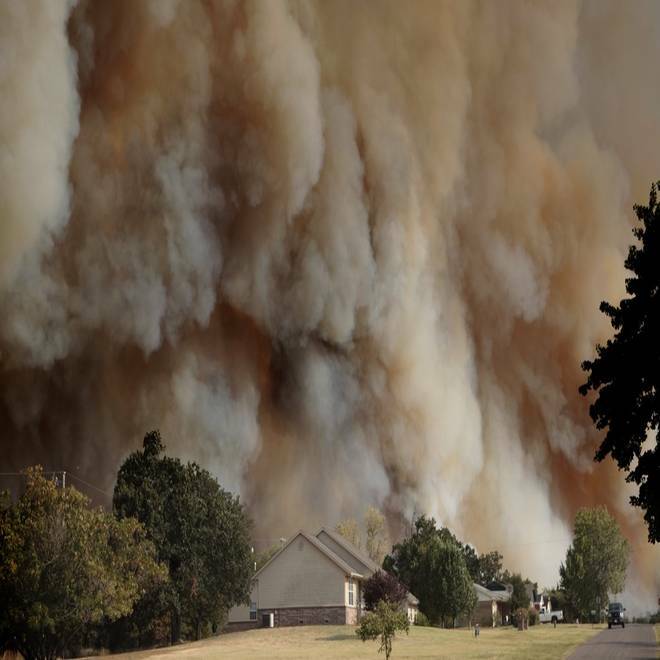 Updated at 12:20 a.m ET: At least 121 structures, many of them homes, have been destroyed by wildfires in Oklahoma, officials said Saturday as temperatures topped 100 degrees for a 19th straight day. New evacuations were under way Saturday as well: Authorities ordered evacuations in the towns of Glencoe, population of around 600, and Mannford, population about 3,000 in Creek County about 20 miles west of Tulsa. Thousands were on the move as the fire in Creek County spread quickly, the Oklahoma Highway Patrol reported. A Glencoe official said 15 to 20 homes had burned in that area on Saturday, KOCO of Oklahoma City reported. A grass fire near Luther consumed 56 structures and hot spots there and at two other large fires kept crews busy Saturday. It has burned 2,600 acres by Saturday evening. Gov. Mary Fallin toured the Luther area on Saturday, calling the devastation "heartbreaking." "A lot of people were at work and didn't realize how quickly the fire was moving," Fallin told Reuters in a telephone interview. "It's emotional. For the children, it's very emotional to lose their possessions." Authorities suspect that fire might be arson: The Oklahoma County Sheriff's Department said it received a 911 call from a man who reported seeing another man toss a lighted newspaper from a pickup truck window on Friday afternoon. Residents returning to their homes Saturday found charred timbers poking from the debris and the burned out shells of refrigerators, washers and dryers. "It's all gone. All of our family pictures, everything was there," said Victoria Landavazo, clutching a young child in her arms. Tracy Streeper was working in Oklahoma City, about 40 miles southwest, when she learned the fire was approaching. Caught in traffic, it took her a long time to reach home and then, "once we got here, we had maybe 30 minutes." A wildfire has consumed over 2,000 acres in Cleveland County, Oklahoma, burning buildings and forcing evacuations. NBCNews.com's Al Stirrett reports. She grabbed a few clothes, medicine and her three dogs and left quickly. 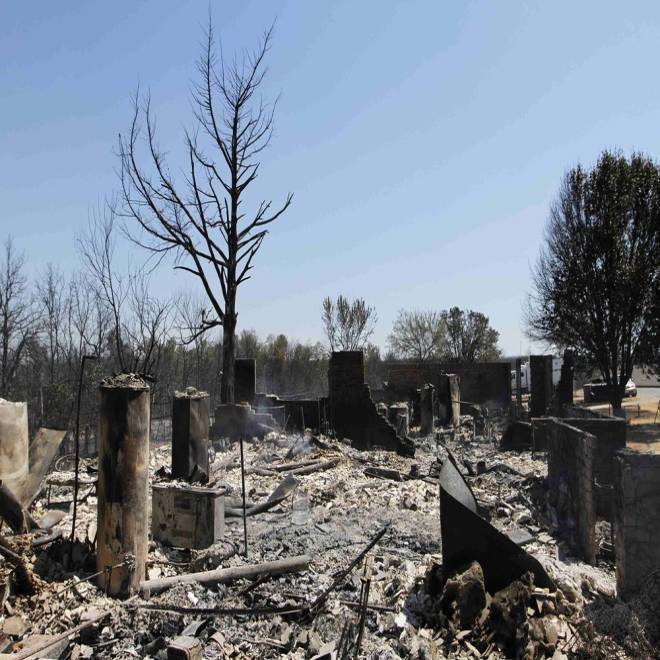 Remains of a home burnned to the ground are seen in Luther, Okla., on Saturday. "Your adrenaline is running. You're pumped up," Streeper said. "You could just see a wall of flames coming this way. Everything was on fire." Casey Strahan said he went outside after power went out in the home he rents about 4:30 p.m. He looked south and saw smoke rising in the distance. He thought it was moving away from him until police ordered him to leave. He rushed through the house, grabbing clothing, photos and a computer as he went. When he returned Saturday, he found the house burned to the ground. "I just never thought it was really going to get us," said Strahan, a softball and girls basketball coach at Luther High School. Fires near Mannford and Noble claimed another 65 structures. Two new fires broke out on Saturday, and Oklahoma now is fighting 13 across the state, said Forestry Services spokeswoman Michelle Finch-Walker. A state-wide burn ban was issued by Fallin on Friday. Oklahoma has contacted neighboring states for help but, with the exception of Texas, neighbors have had to focus on their own fire threats, Fallin said on Friday. "There's fires in Arkansas. There's fires in Kansas and Texas. Everybody else is on high heat alert," she said. A home burns during a large wildfire Friday, Aug. 3, 2012 in Luther, Okla.
Oklahoma joins several states that have been plagued by wildfires this summer, including Colorado, Arkansas and Nebraska. Fires are being fed by a widespread drought. Nearly two-thirds of the contiguous United States was under some level of drought as of July 31. Low humidity, strong southerly winds and drought conditions enabled the wildfires to spread quickly across treetops, said Michelann Ooten, deputy director of the state's Office of Emergency Management. "It's just a very difficult situation we're facing that's all weather related," Ooten said. The heat in Oklahoma City, the state capital, has reached historic levels. On Friday, Oklahoma City tied its all-time record for the highest temperature ever recorded when the thermometer reached 113 Fahrenheit, a mark last recorded in the Dust Bowl days in 1936. It's so hot that some volunteer fire departments have made a public plea for Gatorade donations to keep their crews hydrated in the scalding conditions.